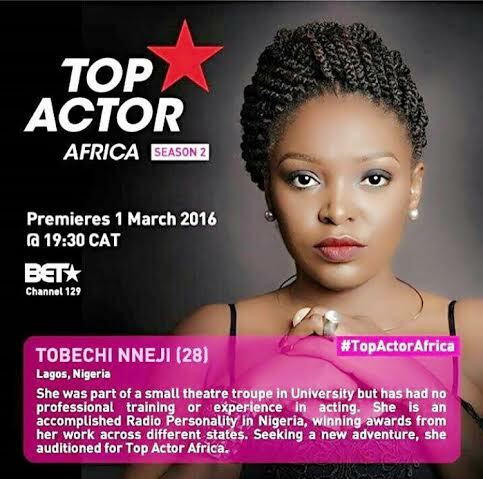 Tobechi Nneji has become the last Nigerian contestant to be evicted from the ongoing BET Top Actor Africa after 9 weeks of Intense competition. This comes after Ifeanyi Dike was evicted the previous week during the ‘Wild Coast Sun Commercial’ Challenge. Following Tobechi’s eviction on the episode which featured Hollywood actress Erica Ash, BET (DStv channel 129) has revealed that Jesse Suntele(South Africa), Shamilla Miller (South Africa) and Alex Khayo (Kenya) are the finalists in the “Top Actor Africa” dramatic reality contest. Tobechi Nneji (Nigeria) who failed to make the cut, took her final curtain call on the show this week. She, alongside 3 other contestants, were tasked with the “Romantic Period Piece” challenge. The actors were later joined by actor/celebrity Erica Ash (Real Husbands of Hollywood and “Survivor Remorse”), as they embarked on their toughest challenge to date. While Jesse, Shamilla and Alex rose up to the task, Tobechi Nneji, got emotional and was evicted. As the last three contestants approach the final hurdle, they will be tasked with a final challenge, “Action Movie”, in which they will have to pull out all the stops to convince the judges that they deserve the Top Actor Africacrown. With just a few weeks remaining until the winner is announced, BET viewers will be able to vote for their favourite Top Actor by visiting www.betafrica.tv from Wednesday 4 May to Tuesday 10 May. The winner will be revealed on May 24, 2016. BET Top Actor Africa Season 2 Episode two airs every Tuesday at 6.30pm WAT on BET Channel 129. For more information on BET, visit www.betafrica.tv, like us on Facebook at www.facebook.com/BETinAfrica or join the conversation about the channel on Twitter and Instagram @BET_Africa using the hashtag#TopActorAfrica.